I am a conservative. You can't get more conservative than being a conservationist. Our entire raison de etre is to conserve and protect. 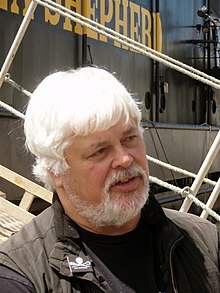 Paul Watson (born 2 December 1950) is the founder of the Sea Shepherd Conservation Society. He is involved in the environmental movement and the movement for animal rights. All social change comes from the passion and intervention of individuals or small groups of individuals. I find it abhorrent to sit there and watch a whale being slaughtered and do nothing but "bear witness" as they call it. Why is that bag of paper more valued than the future heritage of this nation? We're now in the midst of a 3rd World War, but this time the enemy is ourselves, and the objective is to save the planet FROM ourselves. There's no hope for masses of humanity to do anything — they never have, they never will. All social change comes from the passion and intervention of individuals or small groups of individuals. Slavery wasn't ended by any government or any institution. Women got the right to vote not because of any government. The civil rights movement, the same thing. India with Mahatma Gandhi, South Africa with Nelson Mandela. Again, it's always individuals. You need those individuals with the passion and the energy to get involved. In fact, I don't know of any government or any institutions that are doing anything to solve any of these problems. All over the world, all I am seeing is individuals and non-government organizations that are passionately involved in protecting ecosystems and species, and that's where I see some optimism. That's where I see results are happening. All of our targets were criminals, they were all operating in violation of international whaling laws. We have intelligent species on our planet that we are not even trying to communicate with. Martin Luther King, Jr. once wrote that you cannot commit an act of violence against a non-sentient object. Back in 1986, the Green Party of Canada tried to toss me out of the Party for sinking whaling ships on the ground that it was a violent act. I pointed out that the Green Party of Canada supported violence when it was convenient politically — for example they supported and continue to support abortion which is, like it or not, a violent act, certainly more violent than sinking some metal into the sea. Violence is not violent when we justify it, be it abortion, or war, or eating meat for example. I support abortion but I'm not a hypocrite about it — it's violent, I accept that. Every American taxpayer accepts the violence that their tax-dollars fund. The Sea Shepherd Conservation Society is a conservative organization. I am a conservative. You can't get more conservative than being a conservationist. Our entire raison de etre is to conserve and protect. The radicals of the world are destroying our oceans and our forests, our wildlife and our freedom. It's dangerous & humiliating. 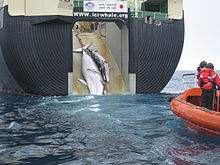 The whalers killed whales while green peace watched. Now, you don't walk by a child that is being abused, you don't walk by a kitten that is being kicked to death and do nothing. So I find it abhorrent to sit there and watch a whale being slaughtered and do nothing but "bear witness" as they call it. I think it was best illustrated a few years ago, the contradictions that we have, when a ranger in Zimbabwe shot and killed a poacher that was about to kill a black rhinoceros and uh human rights groups around the world said "how dare you? Take a human life to protect an animal". I think the rangers' answer to that really illustrated a hypocrisy. He said "Ya know, if I lived in, If I was a police officer in Herrari and a man ran out of Bark Place Bank with a bag of money and I shot him in the head in front of everybody and killed him, you'd pin a medal on me and call me a national hero. Why is that bag of paper more valued than the future heritage of this nation?" This is our values. WE fight, WE kill, WE risk our lives for things we believe in... Imagine going into Mecca, walk up to the black stone and spit on it. See how far you get. You’re not going to get very far. You’re going to be torn to pieces. Walk into Jerusalem, walk up to that wailing wall with a pick axe, start whacking away. See how far you’re going to get, somebody is going to put a bullet in your back. And everybody will say you deserved it. Walk into the Vatican with a hammer, start smashing a few statues. See how far you’re going to get. Not very far. But each and every day, ya know, people go into the most beautiful, most profoundly sacred cathedrals of this planet, the rainforests of the Amazonia, the redwood forests of California, the rainforests of Indonesia, and totally desecrate & destroy these cathedrals with bulldozers, chainsaws and how do we respond to that? Oh, we write a few letters and protest; we dress up in animal costumes with picket signs and jump up and down; but if the rainforests of Amazonia and redwoods of California, were as, or had as much value to us as a chunk of old meteorite in Mecca, a decrepit old wall in Jerusalem or a piece of old marble in the Vatican, we would literally rip those pieces limb from limb for the act of blasphemy that we’re committing but we won’t do that because nature is an abstraction, wilderness is an abstraction. It has no value in our anthropocentric world where the only thing we value is that which is created by humans. This page was last edited on 18 February 2018, at 11:22.